President Trump has embarked on the most aggressive regulatory rollback in history. President Trump declared war on the “regulation industry” on his first day in office, arguing it was “choking” economic growth. He immediately signed a “two-for-one” executive order requiring federal agencies to identify two regulations to eliminate for each new rule they want to impose, and with the help of the Republican-led Congress, he has killed or delayed more than 860 federal rules and regulations affecting almost all facets of everyday life—from environmental regulations banning coal plants from dumping waste into public waterways to mattress flammability standards and meat- and poultry-processing guidelines. “There’s never been a president— and I am including President Reagan—who has been harsher, and more aggressive,” says Rena Steinzor, professor at the University of Maryland Francis King Carey School of Law. Which agency is leading the way? 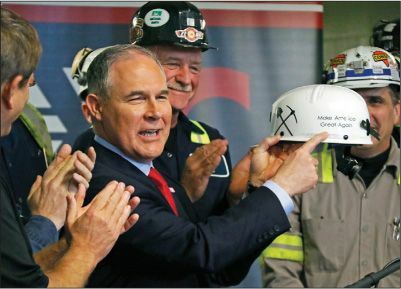 The Environmental Protection Agency, headed by former Oklahoma Attorney General Scott Pruitt. A climate change skeptic, Pruitt sued the EPA 14 times as attorney general—nearly always in partnership with the oil and gas industry. As EPA head, Pruitt is gutting former President Barack Obama’s environmental legacy, moving to rescind the Clean Power Plan and undo limits on greenhouse gas emissions from existing power plants, as well as lifting the ban on offshore drilling in the Arctic, Pacific, and Atlantic oceans. Pruitt is also targeting basic anti-pollution guidelines. He outraged environmentalists and public health scientists by scrapping a rule prohibiting power plants from dumping toxic pollutants— including arsenic, lead, mercury, and cadmium— into public streams, rivers, and lakes. In addition, the EPA has rescinded a proposed ban on the widespread use of the pesticide chlorpyrifos on crops, despite evidence it can damage children’s neurological development. The Interior Department has rolled back a ban on coal mining on public lands, and recommended that Trump use an executive order to shrink at least three national monuments in Utah and Oregon to open up hundreds of thousands of acres to mining and drilling. The Labor Department has postponed a rule that would have minimized construction workers’ exposure to carcinogenic silica dust, while Betsy DeVos’ Education Department wants to eliminate more than a half dozen Obama-era measures designed to protect students from forprofit colleges’ predatory loan practices. What do businesses think of deregulation?